One bedroom on the ground floor features bunk beds (the bottom one is a small 120×200 double), and the second mezzanine bedroom features a large 180×200 double bed . The living/dining area also includes a sofa bed plus a fully equipped kitchen. The cottage includes a private garden and pretty terrace. 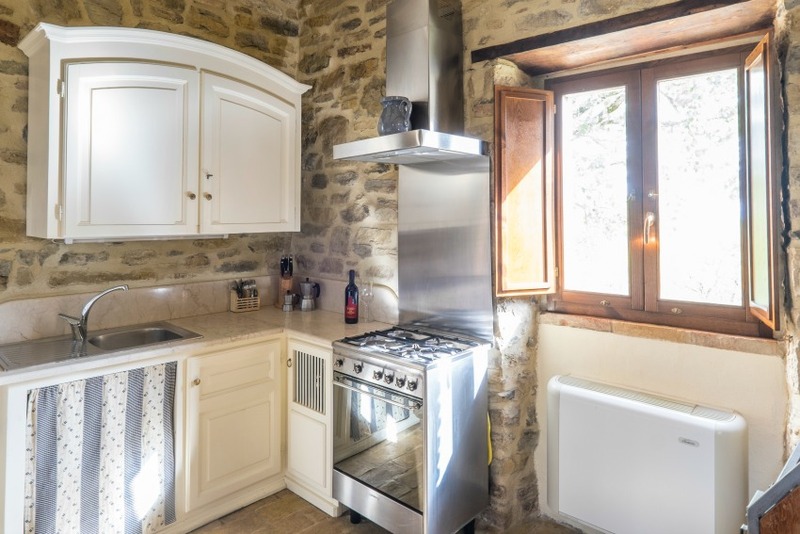 A studio featuring kitchenette, bedroom area with a double or twin beds, bathroom with shower and a separate dining area, with space for a cot or cot bed, plus wraparound terrace. A full kitchen and living/dining area with sofa bed on the ground floor, with a bedroom (with twin beds or a double) and bathroom with shower above. 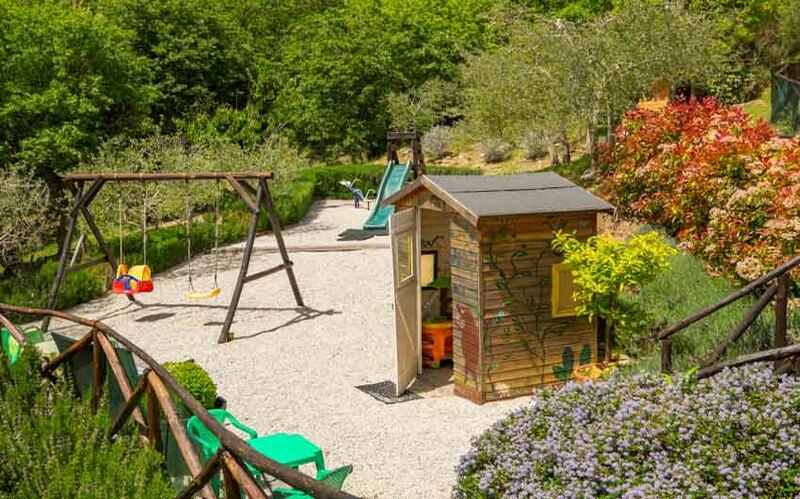 are three charming family-friendly self-catering houses. 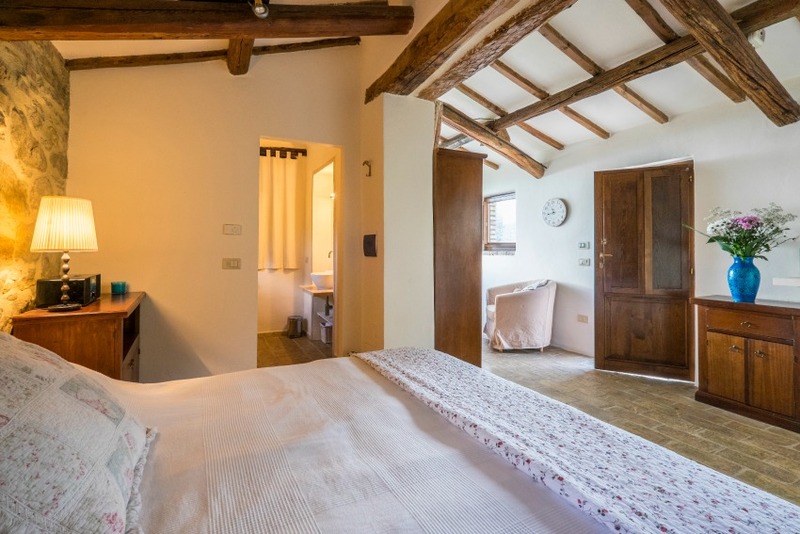 The Stable House: a studio featuring kitchenette, bedroom area with a double or twin beds, bathroom with shower and a separate dining area, with space for a cot or cot bed, plus wraparound terrace. 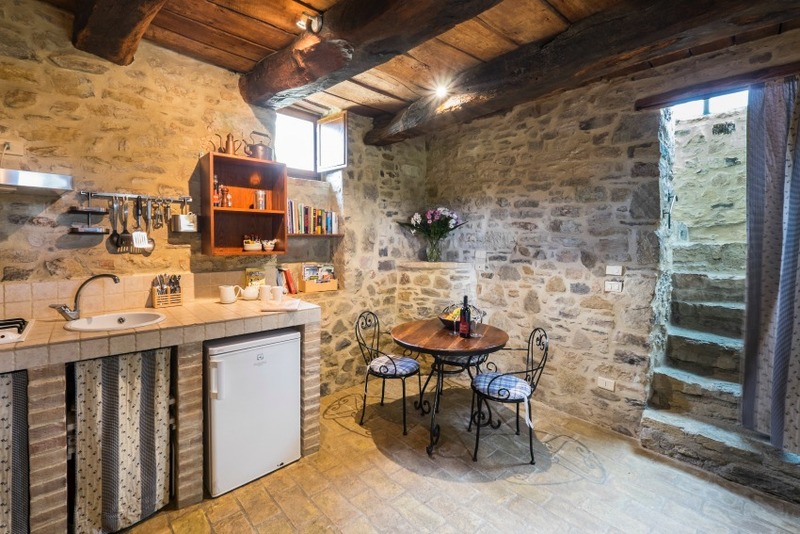 The Wine Cellar House: a full kitchen and living/dining area with sofa bed on the ground floor, with a bedroom (with twin beds or a double) and bathroom with shower above. 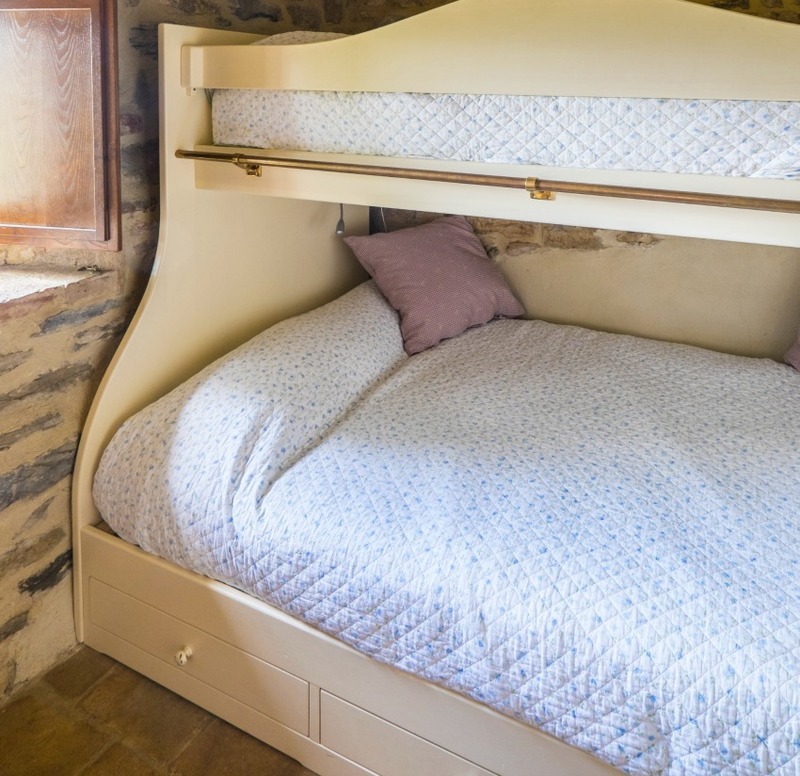 The Hayloft House: one bedroom on the ground floor features bunk beds (the bottom one is a small 120×200 double), and the second mezzanine bedroom features a large 180×200 double bed . The living/dining area also includes a sofa bed plus a fully equipped kitchen. The cottage includes a private garden and pretty terrace and is perfect for families. Nearest airports are Perugia (about 25 minutes), Florence (about 1.5 hrs)and Ancona (about 1.5 hrs). 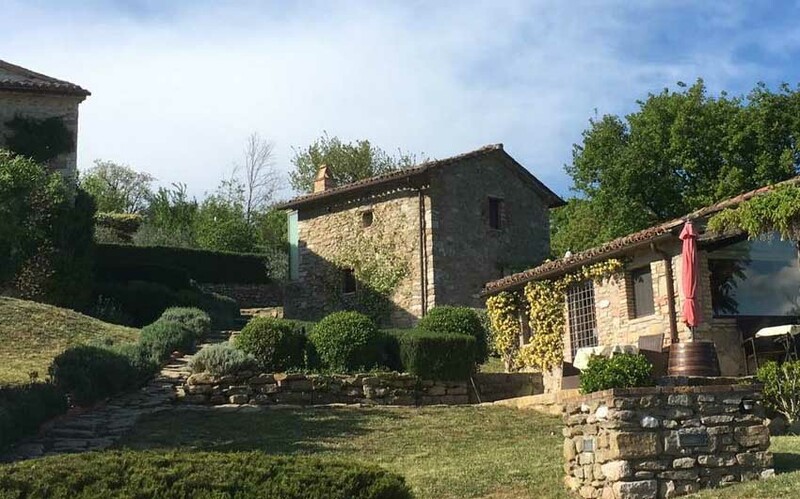 Situated in a stunning valley, the Umbrian Country Cottages are a magical option for families seeking tranquillity and relaxation in the heart of Italy. Three divine stone cottages, sleeping between two and six guests (with extra space for cots) look out over miles of uninterrupted countryside. With rose bushes clinging to the outer walls and private terraces with fantastic views, the situation and atmosphere is idyllic. 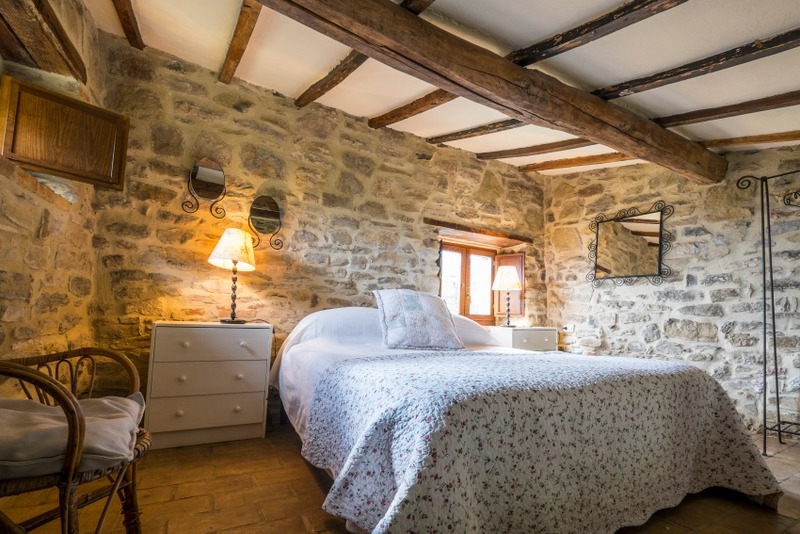 Each cottage has been beautifully restored, preserving the heavy wooden beams and natural stone walls, and an enchanting makeover has added bright, country-style kitchens, warm wooden furniture, quilted beds and modern bathrooms. 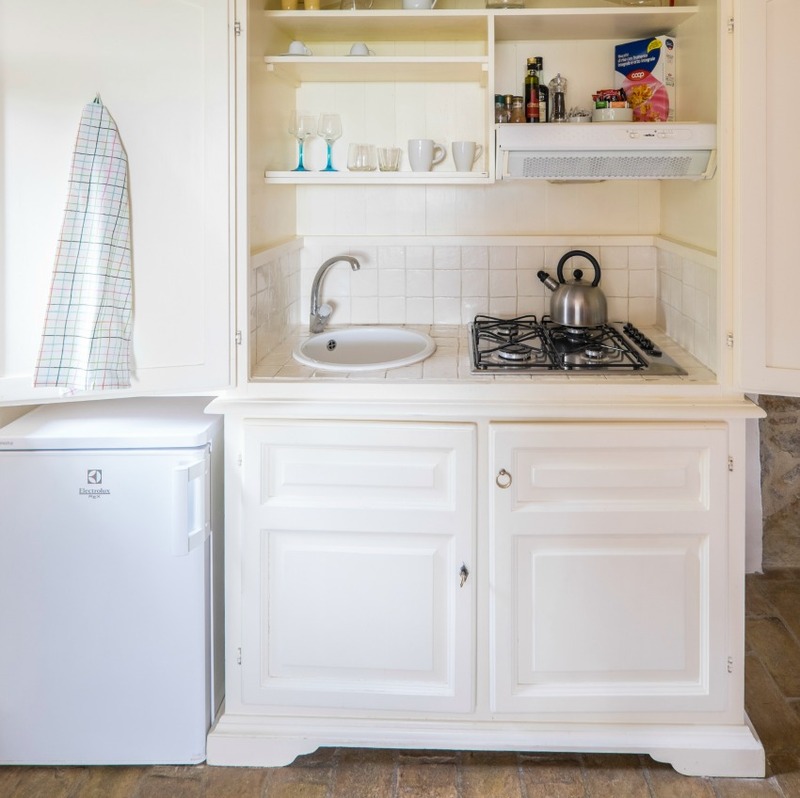 Offering an ideal combination of self-catering accommodation with the convenience of hosts living on site, the British/Australian owners are always available to help out with advice and recommendations. The two and a half acre grounds (steep in places, so keep an eye on very little ones!) 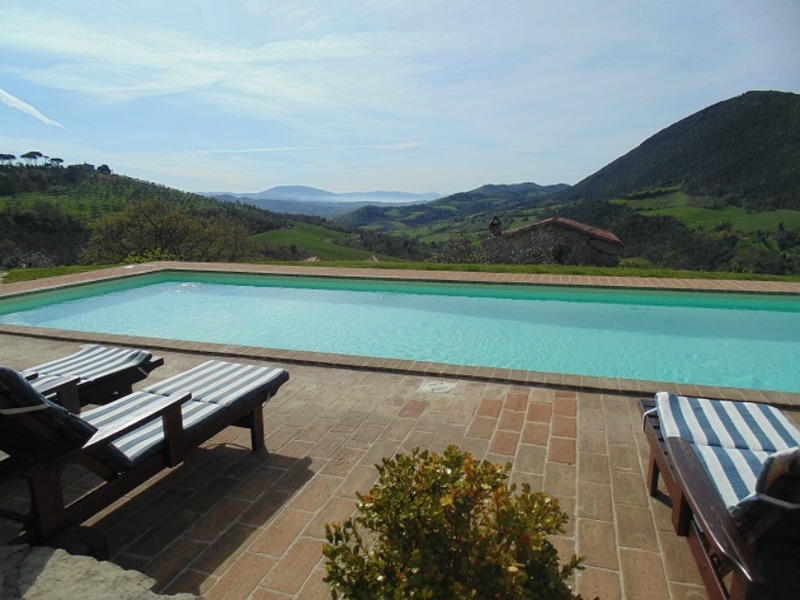 include a sensational fenced pool from which one can gaze down the endless valley, and a playground equipped with plenty of toys and a playhouse. 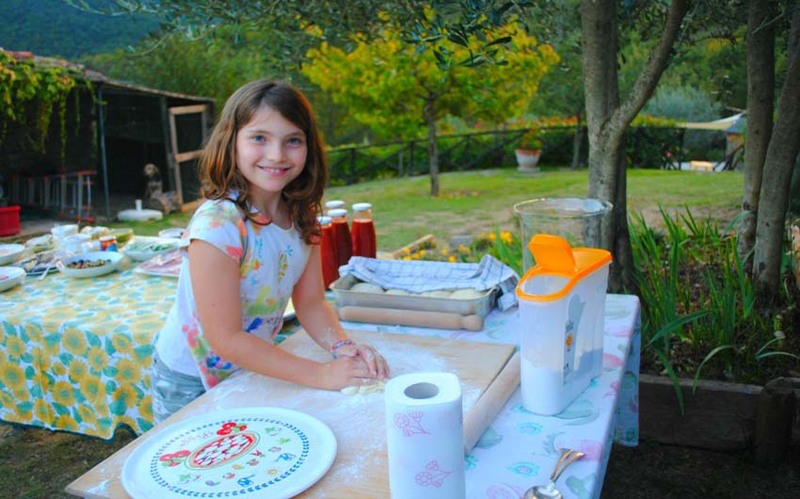 Guests can help themselves to fruits, herbs and vegetables from the gardens, try their hand at making pizza in the old bread oven or enjoy an alfresco barbecue. 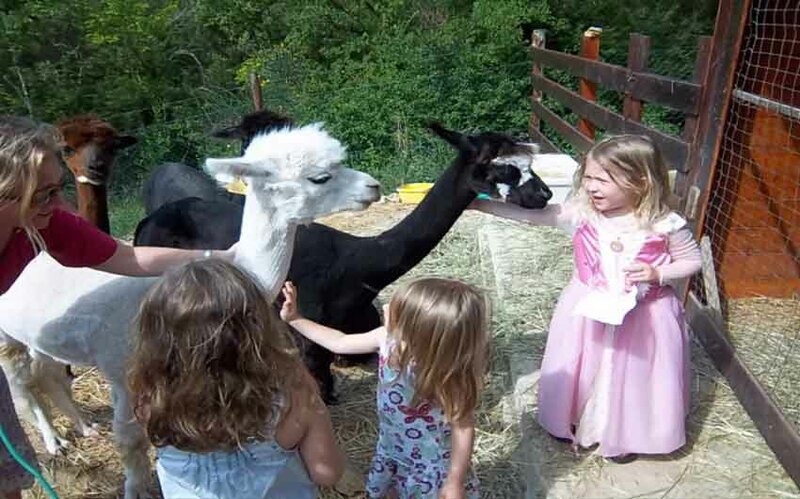 Children are bound to love the family of adorable alpacas that live here, as well as the two friendly dogs. In the event of a rainy day, a library in the main house has a hood supply of games, books and DVDs for kids, and novels, travel guides and cookery books for parents to brose. For a little extra indulgence, chefs can be booked to prepare meals, and breakfast provided if requested. Tennis rackets and gold clubs are provided and on-site massages can also be arranged. Please note they have a 7 night minimum booking policy for high and peak season and the change-over day is usually Saturday. In the lower season the owners are flexible on number of nights. Prices are inclusive of all local taxes. 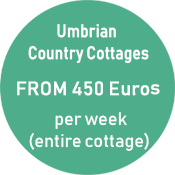 An additional security deposit of €150 is required on check in, which is fully refundable on final inspection of the cottage. Please note prices include all linen, towels and final cleaning and an additional charge will be made for heating. A deposit of 30% of the total fee is payable upon confirmation of booking with the balance due 2 months before arrival. If the booking is cancelled before the final payment is due to be paid, the owners will retain the booking deposit, unless they manage to re-let the property. If the booking is cancelled after the final payment is paid, guests will be required to pay the rental price, unless the owners manage to re-let the property. If the owners can re-let the property they will refund the money paid less seventy-five (€75) Euro administration fee. "Ich kann eine Reise mit The Little Voyager wärmstens empfehlen! 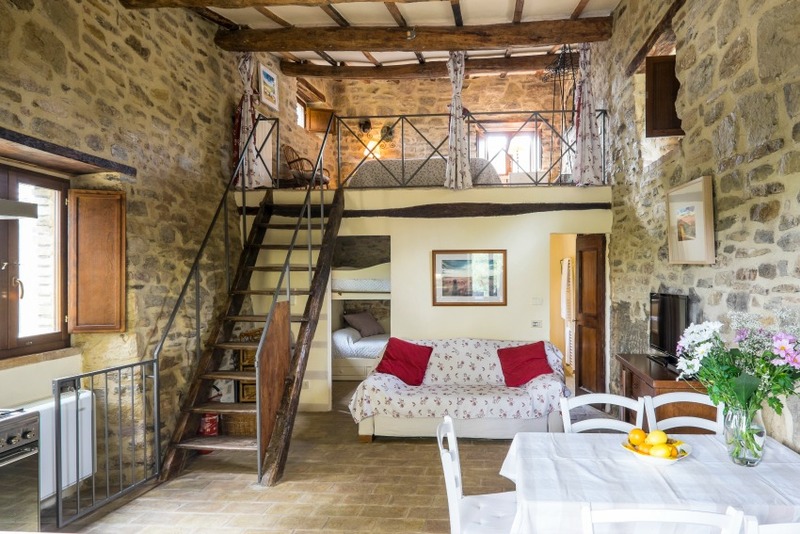 Wir waren mit The Little Voyager in Umbrien (The Umbrian Country Cottages) Ende September und hatten eine fantastische Zeit. Wir sind mit einem zweijährigen Kind von Berlin aus geflogen und hatten einen tollen Urlaub. David und Chrissie, die Eigentümer, waren perfekte Gastgeber. Sie haben alles möglich gemacht, dass wir es besonders schön hatten, mit unserer kleinen Tochter. Alpakas füttern, kleiner Spielplatz mit Rutsche, Schaukel und Spielhaus, Hochstuhl, Reisebett, alles war vor Ort. Die Anlage ist schön gelegen, ruhig, sehr gepflegt und sauber. Am ersten Abend kamen wir spät an, konnten nichts mehr einkaufen und wurden mit Pasta und Wein versorgt. An einem Abend haben alle Gäste zusammen Pizza gebacken. Man kann sehr schöne Ausflüge machen in der Umgebung und von dem Pool auf dem Hügel hat man eine atemberaubende Aussicht. Sehr empfehlenswert! Im Vorfeld wurden wir von Ilonka, von The Little Voyager, fantastisch betreut und beraten. Jeder unserer Fragen wurden sehr schnell beantwortet. Da wir an einem Samstag Abend sehr spät ankamen, freuten wir uns über eine Flasche Wein und am nächsten Morgen über ein Frühstück, dass Ilonka für uns organisiert hatte. Ich kann eine Reise über The Little Voyager wärmsten Herzens empfehlen." 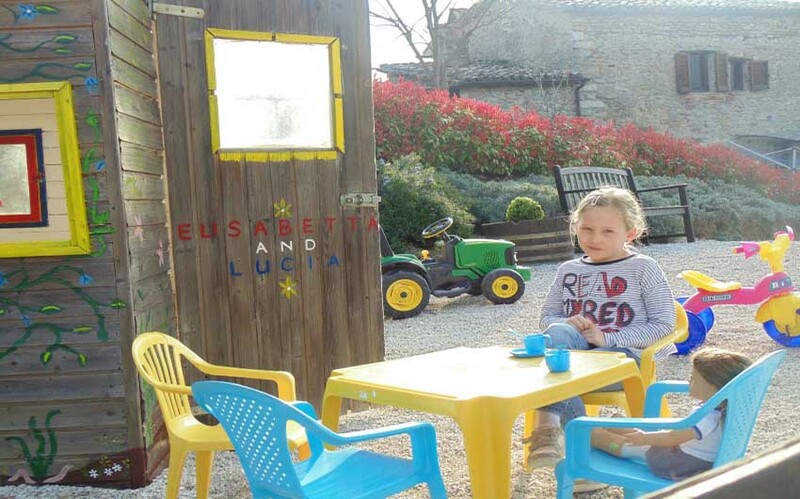 "Hemos tenido una excelente experiencia en Umbrian Country Cottages, gracias a la agencia de viajes Little Voyager quienes nos hicieron la propuesta del lugar . Encontramos un lindo lugar, con hermosas vistas ideal para descansar y conocer los alrededores. La hospitalidad de los propietarios fue excelente y el lugar nos permitió pasar una semana de encanto. Lo recomendamos sin duda, si quieres estar en contacto con la naturaleza y relajarte." 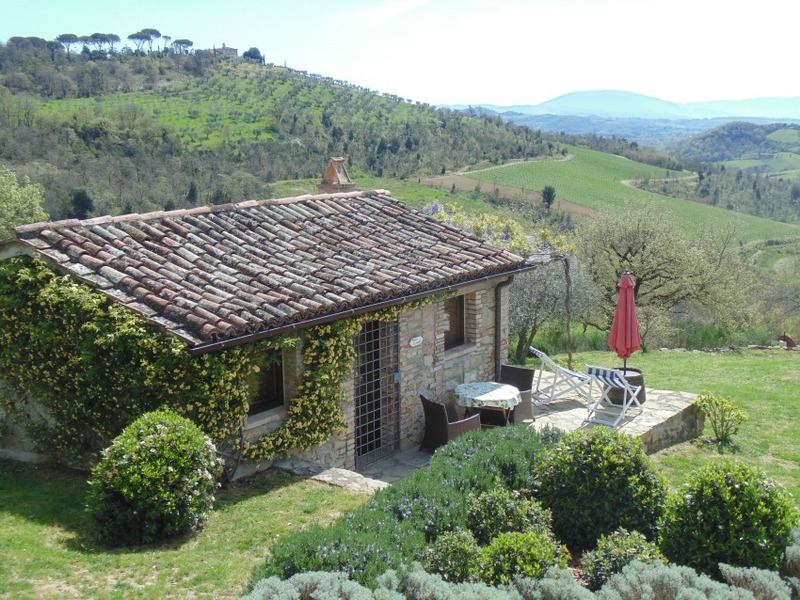 "Our stay in Umbria was exactly what our family was looking for. A perfect location away from all the city hustle and bustle but at the same time, accessible to many picturesque towns and villages. The cottages are beautifully restored in an idyllic setting. The hosts are ready to provide all kinds of children's equipment as required to make the stay as easy as possible. Our kids (aged 5 and 3) loved the amazing toys and play area and we all enjoyed the pool and the beautiful view. The wood fire pizza night and wine tasting organised by the hosts was a great evening for all. If you are looking to have some quality family time in a beautiful location, this property is what you need!" 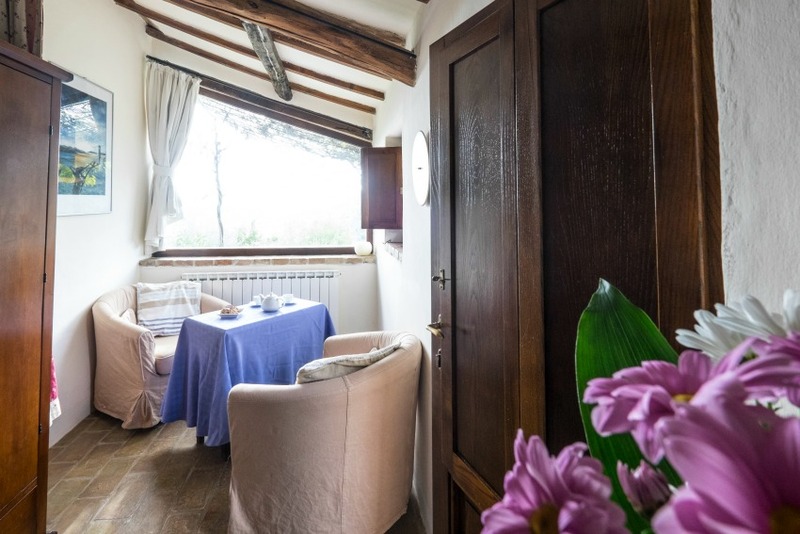 A studio featuring kitchenette, bedroom area with a double or twin beds, bathroom with shower and a separate dining area, with space for a cot or cot bed, plus wraparound terrace. This cottage is perfect for a couple with a baby. 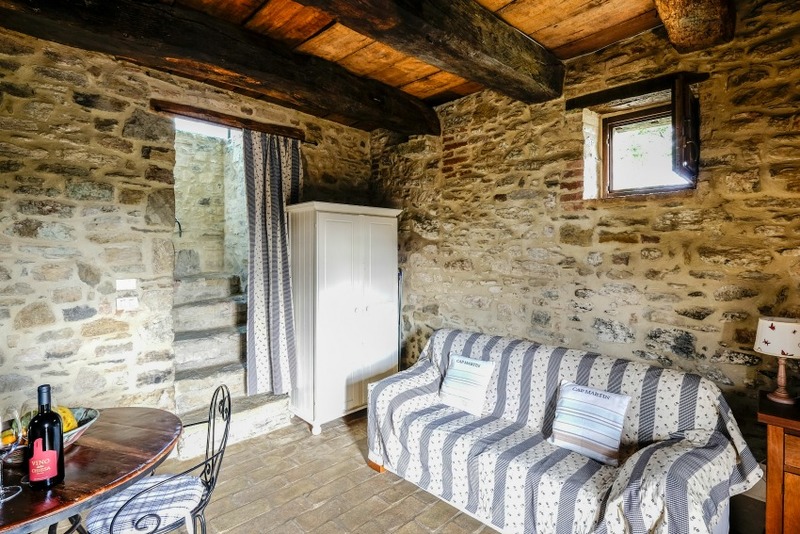 This cottage is perfect for a couple with a baby or small child. One bedroom on the ground floor features bunk beds (the bottom one is a small 120x200 double), and the second mezzanine bedroom features a large 180x200 double bed . The living/dining area also includes a sofa bed plus a fully equipped kitchen. The cottage includes a private garden and pretty terrace and is perfect for families. The mezzanine bedroom is not suitable for small children. 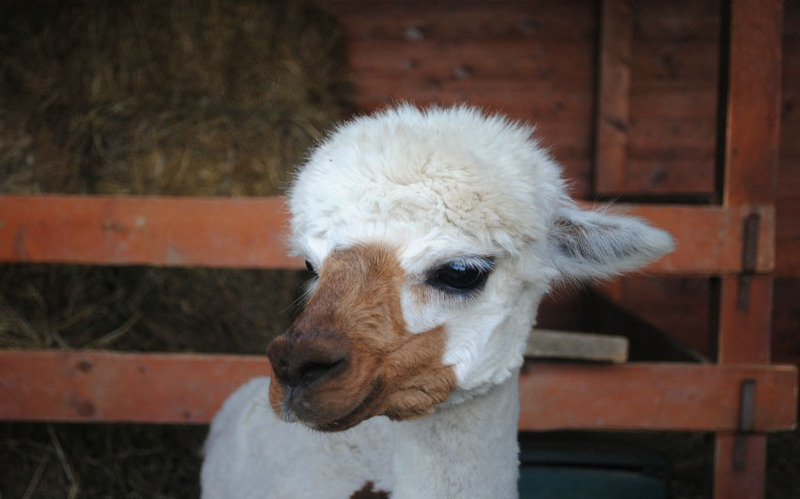 A family of alpacas are kept in an enclosure and can be freely visited by children and adults alike. These affectionate and endearing creatures are sure to charm young and old alike. A well-equipped communal playground has all sort of toys for little ones, including a playhouse, swings, slides, tractors and toys. A library in the main house is stocked with novels, maps, travel guides and books for adults, plus toys, children’s books and DVDs. A 14.5 x 4.5 metre pool is fully fenced making it safe for children, while parasols, sun loungers and exceptional views also make it an inviting spot for parents to relax with a glass of wine. The Tavernelle water park features two indoor and two outdoor pools with water slides, surrounded by lawns. The Sansepolcro water park also has two pools, slides and a diving board. A large play area and space for picnics makes it a good bet in summer. A zoo and adventure park on the outskirts of Perugia, featuring both domestic and wild animals, various play areas and a train. It is a lovely day out for families with young children. Tour the Perugina chocolate factory and museum in Perugia. One-hour tours are available in various languages and include a taste of different chocolates! A large indoor play centre on the outskirts of Assisi this is a good option in cooler weather. There is a nice restaurant and bar and activities to keep children and adults happy for hours. An outdoor activity park with obstacle courses involving zip lines and rope bridges as well as a water slide with inflatable tubes. 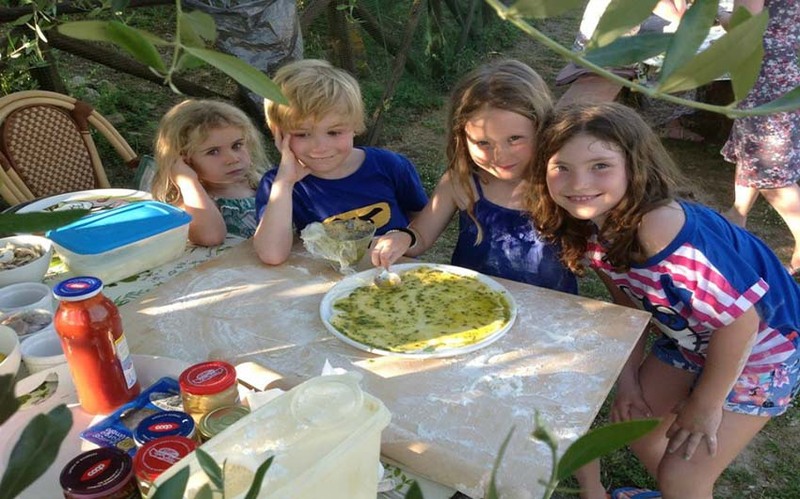 There are activities suitable for all age groups. A theme park near Florence based on the fairytale, the park features statues and fountains of the Pinocchio characters, a puppet show and wonderful gardens. The spectacular Marmore waterfalls are located close to Terni in Southern Umbria. At 165 metres in height they are the tallest man made waterfalls in the world, created by the Romans. Only 20 minutes from the property this lovely lake offers all sorts of recreational opportunities: sailing, windsurfing, wake boarding and boat trips to the islands. There are also plenty of walks on shore, museums, craft shops and restaurants. There are lots of easy one and tow hour walks in the valley and your hosts can provide you with maps and directions, or organise a local guide. The championship Antognolla Golf Course is just five minutes away and offers golfers of all abilities the opportunity to play on an expertly designed course. Includes a driving range, clubhouse and pleasant restaurant. Choose to have your hosts book a masseur to come to you at your cottage, or indulge in a few hours at the full serve spa 10 minutes away, where you can enjoy the thermal pools, hydro-massage baths, a Turkish bath and a small café. Food is an essential part of the Umbria experience and the colourful markets which take place in the surrounding villages are well worth a visit, not just for a glimpse of local life, but also for a taste of the region’s high quality olive oil, pecorino cheese, porcini mushrooms and roast suckling pig. A foodie’s dream, a nearby hotel can take you out truffle hunting in the woods. This is followed by a truffle-themed tasting menu. Several nearby vineyards and wineries offer tours and tastings followed by a delicious meal. An hour’s drive away, Perugia is a vibrant city with a rich artistic past. Spend a day exploring the submerged tunnels beneath Piazza Italia, the maze of medieval alleys and the collection of fine art within the Palazzo del Priori. The Basilica di San Francesco is Assisi’s star attraction, not only for its architecture but for also for the impressive collection of fine art within it. Aside from the basilica, the narrow streets and open squares are fun to explore and the ancient, pink stone houses are particularly pretty. Florence, the cradle of the Renaissance, can be visited in day, by car or train. Top sights in Florence include the Uffizi Gallery, the oldest art gallery in the world, the medieval cathedral with its iconic dome, the Ponte Vecchio bridge, lined with jewellery shops, and Michaelangelo’s David, at the Galleria dell’Academia. 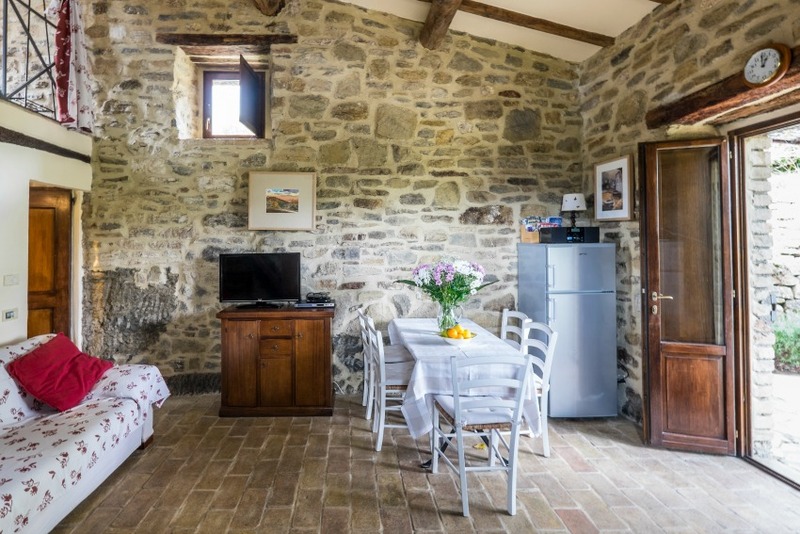 Located 1.5 km down an unpaved road, the Umbrian Country Cottages are wonderfully secluded, yet only a 5 drive from the nearest village. The immediate surroundings are a patchwork of rolling fields, olive groves and vineyards, with views that go on forever. 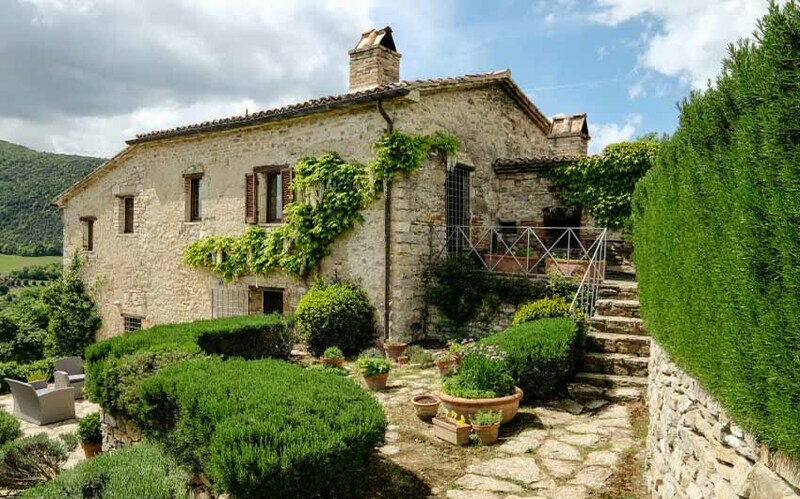 The tranquil setting makes slowing down easy and there are plenty of gentle walks accessible from the property, but for those who want to explore Umbria’s charming hill towns, it’s also perfectly positioned for easy day trips. 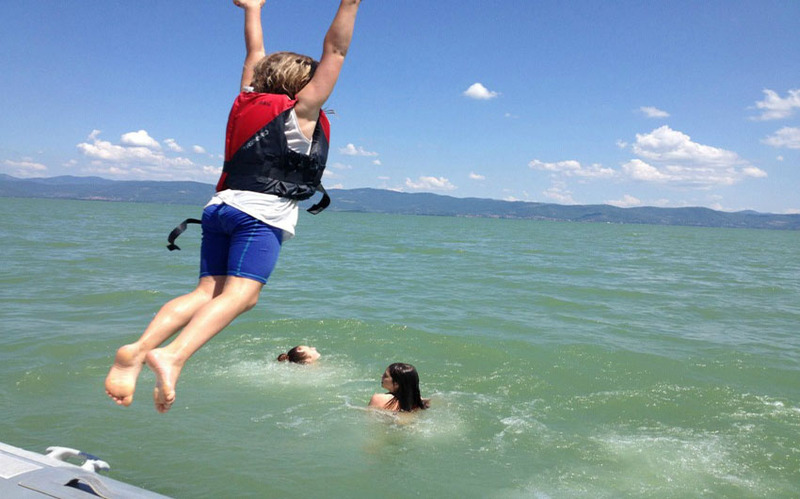 In summer, Lake Trasimeno’s shallow waters are great for sailing, swimming and meals at the water’s edge, whilst visits to local markets offer foodies the opportunity to taste the regions cheeses, olives and produce, and wine touring offers the possibility of sampling some fine local vintages. The charming capital Perugia is less than a half hour’s drive away, and numerous other well-known towns are only a little further afield. 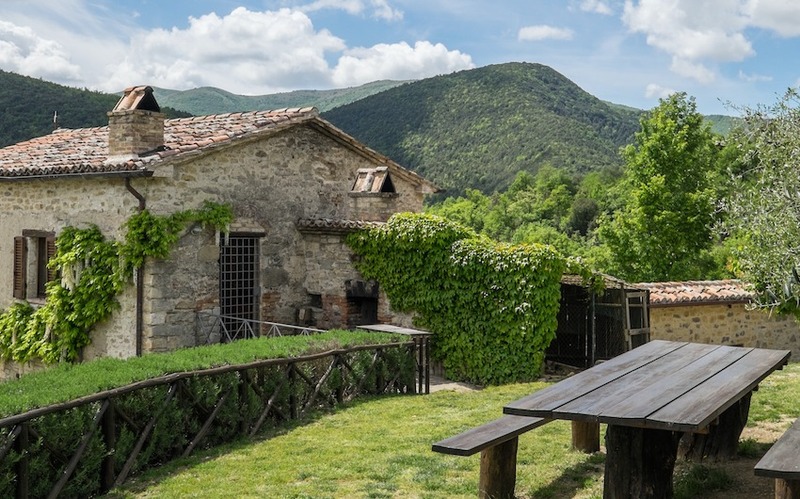 Umbria also has a busy calendar of local festivals and events, which offer a genuine insight into local culture and traditions, so check with your hosts what is happening during your stay.